It has been a while since I have written a “Rethinking Guitar,” but today I stumbled across an interesting topic with which to post: Feedback Loops. Many of you have seen companies come up with their own version of a Feedback Loop. Fairfield Circuitry has one, Electro Harmonix has a version of it, Devi Ever, Death By Audio, Audible Disease, and Dwarfcraft Devices all have one, and there are DIY Feedback Loops as well. A Feedback Loop is when you take an effect or chain of effects and feed them back upon each other. For distortion effects, it can be a tuned note or frequency that changes with the manipulation of the knobs or even your guitar’s volume. A delay can bring about swells and infinite repeats. 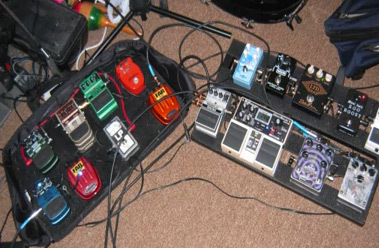 Modulation and filter pedals are the more temperamental effects, some pedals do nothing while others are completely wild. You tend to find these devices in the hands of noise artists, but a small percentage of artists in various genres of what we generally know as “pop” music are using them. I am one of those musicians who uses the feedback loop for many things in my band, The Common Men. I thought it would be cool to demonstrate an interesting take on using feedback loops with your playing. I have a video of me going through various settings of my feedback loop while playing leads and riffs. You will notice how I can punctuate a note or make a phrase trail off into total sonic mayhem with just the flip of a switch. Most feedback loops give you the option of how much feedback you can create. I keep the controls at minimum so my guitar signal still comes through when it is engaged. 00:20 – 01:29 I’m mainly just using a Feb Distortion and Fab Flanger through the loop. The slow flanger really comes into play when I roll off my volume knob, thus creating a very melodic feedback. 01:45 – 04:00 I’m using the synth and octave down settings on my Digitech Synth Wah. Engaging the feedback loop causes the guitar signal to be choked when I have really strong octave down and octave up settings. When the guitar signal dies, it almost has a bit-crushing-like tone to it. 04:00 – end I’m using all of my effects at once, and using a stronger auto wah feature that sounds like a siren when I engage the feedback loop. The chirping sound you hear is actually the breakup of my Devi Ever LP. At times I also engage my Boss Giga Delay and Various kinds of delays on my actual guitar rig. When all of the signals get crossed and bleed into each other, you get some pretty, lovely, and disgustingly beautiful sounds. Have a look at my video and I hope you get inspired to experiment as well! Some Feedback Loops are under 100 dollars and are worth the effort if you want to take you guitar playing some place 99% of other guitarists are not! Brian Cook - Russian Circles - Pedal BoardVFE Pale Horse Winner - Congratulations Mike Kabatt!